The Nokia 7380 isn't your average cell phone. 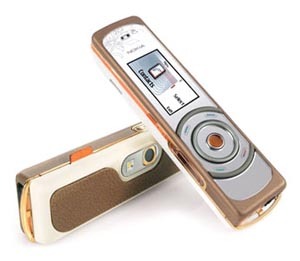 With the introduction of the Nokia 7280 last year, Nokia took a brazen a step forward in the world of fashion phones. With its innovative design--the lipstick shape and the lack of a keypad--the 7280 garnered a lot of attention, even from the celebrity set and the glitterati. And now the Nokia 7380, which is part of Nokia's L'Amour fashion collection, is the successor to the 7280. As with the 7280, the similarly shaped 7380 doesn't look like a phone at all. With its mirror finish and designer motifs inspired by "craft and ethnic influences," it certainly looks like it's meant to be a fashion accessory first, a phone second. The phone's circular spinner "click wheel" controls takes some getting used to and are certainly not for everyone, but they're not too difficult once you get the hang of them. And don't think the phone is just for show--there are quite a few impressive features packed into this tiny device, including Internet access and a megapixel camera. All this comes at a price, though; the Nokia 7380 will sell for roughly $500 to $600, though it may come down if it's picked up by a carrier. At first glance, the Nokia 7380 may look like a fancy compact mirror. It has no antenna or keypad, and by all accounts, it doesn't look like a cell phone. It sports a very appealing mirror finish with copper brown and ivory white accents, and there's even an orange L'Amour designer tag on the right side. On the back is a leatherlike covering located underneath the camera lens and flash, which are also housed in a mirror finish. The left spine holds the SIM card slot drawer, which opens like a latch. Removing the SIM card is easy; just push down the card and it pops out. It's a big improvement over the drawerlike SIM holder on the Nokia 7280 that required a special tool to open. On the bottom are the mic, the charger and headset ports, and a wrist-strap slot. Its sticklike chocolate bar shape measures only 4.5 by 1.2 by 0.8 inches and weighs a light 2.8 ounces. This shape lends itself to an easy fit in the pocket, and it feels cozy in the hand. It's also surprisingly comfortable when held to the ear. On the front is the aforementioned mirror finish complete with a flower motif etched in a corner near the speaker. When the phone is activated, part of the mirror finish disappears to reveal a tiny 1.25-inch landscape-oriented screen, most likely to accommodate the size and shape of the phone. Though we found the display big enough for making calls and sending messages, its usefulness for other functions is limited. For example, it was a bit small for sending messages, and Web browsing was mostly uncomfortable. The display's 104x208-pixel resolution and 65,536-color palette aren't great, but they're certainly acceptable. On the downside, the screen is very difficult to see under direct light because of the mirror finish. Also, the contrast, brightness, and backlighting time can't be changed. Font size can be changed only within text messages and not elsewhere. Users with vision impairments may have a hard time with this phone. A little lower on the front are the stylized navigation controls. Set in concentric circles, the controls include four indicator lights and a middle OK button that glows orange when activated. The outer circle acts as buttons for two soft keys on one side, and the Talk and End/power buttons on the other. We didn't find it too difficult to press the assigned areas of the circle, but those with larger fingers might feel some discomfort. Also, the keys aren't labeled. The inner circle is known as the Nokia Navi spinner, and it spins like a wheel that you can use to scroll through the menu options as well as dial and send text messages. This may sound like a chore, but it isn't that difficult. When texting, the phone is smart enough to guess the next letter in a word, and you can select letters by simply scrolling through them. Dialing is a little harder, as you have to scroll back and forth more frequently; you can't dial by letters as there's no keypad. However, the phone was intended to be used with a pre-established contacts or a calls list stored in the phone and SIM card, so you can either dial by voice commands or simply navigate through your address book. We were disappointed that there are no volume rocker and no dedicated camera button on the phone. Also, the Nokia 7380 uses an internal rechargeable battery that cannot be replaced by the consumer; instead, it must be sent to an authorized service facility. It's unclear if this will be worth the time and money if and when it occurs. One of the more surprising aspects of the Nokia 7380 is the impressive feature set in such a small form factor. Nokia has managed to cram in a 2-megapixel camera, an MP3 player, and a video recorder. More on that later but first, the basics: The phone comes with a 1,000-entry address book that stores five numbers, an e-mail address, a mailing address, a Web address, and notes for each contact. Voice tags are added automatically to your contacts for voice dialing, and you can assign an image per contact for photo caller ID, though with a screen this size, this is of questionable value. You can also sort them in up to 25 groups, but we didn't notice an option for personalized ring tones. The Nokia 7380 comes with five different profiles (General, Silent, Meeting, Outdoor, and Pager) that allow for different ring volumes and vibration settings, as well as 18 different polyphonic ring tones in AAC; it also supports MIDI and MP3 ring tones. Other features include text and multimedia messaging, an alarm clock, a calendar, a to-do list, notes, a voice recorder, and a speakerphone. You can also utilize Bluetooth and the Nokia PC Suite software to transfer content to and fro the phone and the PC. There isn't any infrared connectivity, though the Bluetooth more than makes up for it. A WAP 2.0 Web browser is also available, but the screen makes surfing the Internet a pain. The biggest upgrade from the Nokia 7280 to the Nokia 7380 is the 2-megapixel camera, a far cry from the 7280's VGA camera. Not only does it have up to 4X zoom, it even has a flash and a self-timer function. You can also select up to four image sizes (320x240, 800x600, 1,152x864, and 1,600x1,200), three different image-quality settings (High, Normal, and Basic), and three different modes (standard, portrait, and night); name image titles on the fly; and choose whether to have a shutter sound. Despite the higher image quality, it was difficult to note the difference when capturing an image because of the phone's screen size. As mentioned, the camera can also record video at 176x144 pixels in 3GP format. Resulting images were surprisingly clear and detailed for a camera phone, and the captured videos were good enough, considering its low resolution. A new feature on the Nokia 7380 is the addition of a music player that supports MP3 and AAC file formats. While you can't create your own playlists, the track list is easily accessible, and you can place it on shuffle and repeat. There's also a unique feature that lets you play audio via a Bluetooth connection to an external audio device, though we don't see much use to this. Music can be uploaded to the phone via software or via music downloads if the service provider supports it. However, the phone's meager 52MB of memory barely holds the images and videos, so there's probably not enough room on the phone to store more than one or two songs, thus making the music player fairly useless. The Nokia 7380 also features radio functionality, along with the ability to set preset stations. While there aren't any games on the Nokia 7380, it's rife with personalization options. Not only can you choose from seven themes and eight different color schemes, there are also 11 included wallpaper patterns, with an option to download more. You can change the tone settings for message alerts, incoming calls, warning alerts, alarms, and the keypad tone volume. You can also activate a light-effects setting, which makes the middle OK button flicker occasionally. We tested the triband (GSM 850/1800/1900; GPRS) Nokia 7380 world phone with Cingular in the San Francisco Bay Area. Call quality was good, and even though callers on the other line knew we were on a cell phone, the sound was still crystal clear, as was music sound quality. The speakerphone was nice and loud too. As for battery life, we got 2 hours of talk time on a single charge, compared with the rated time of 1.5 hours. The rated standby time is three days; we came away with a solid five days. According to the FCC, the Nokia 7380 has a digital SAR rating of 0.83 watts per kilogram. The good: The Nokia 7380 is a stylish and fashionable phone, perfect as a second cell phone for a night on the town. It features an impressive 2-megapixel camera, along with a video recorder, a voice recorder, a music player, and a radio. The bad: The Nokia 7380 is not for everyone. It has no keypad, so you have to use the phone's circular spinner to dial numbers and send text messages, which may be too much for some users. Those with larger fingers may also be uncomfortable with the narrow circle controls. The phone's small screen and meager 52MB of memory does not make full use of its impressive multimedia features. The bottom line: The Nokia 7380 would not make for a very useful primary phone, but it's satisfactory as a fashion accessory or as a secondary mobile. Even though we appreciate the impressive multimedia upgrades over its predecessor, it's a shame that the phone's screen and memory size does not make full use of them.